Radiators along the baseboard are a common blight on even the most attractive homes. Just as with runner board heaters, radiators look out of place and unsightly, but, unlike the runners, radiators don’t have even the metal covers over them. You can build a handsome wooden cover for your low radiator using simple materials and with only basic woodworking knowledge. This cover is freestanding and can be moved easily and even used as a small table when it's not covering the radiator. 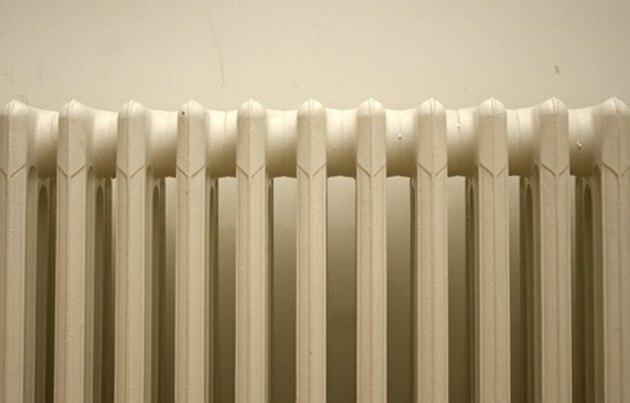 Find the height, width and depth of your radiator by measuring it at its biggest point for each measurement. Use a tape measure, and make sure to include knobs and spouts in the measurements. Add 1 inch to the height measurement and cut two pieces of wood to this measurement with a saw. Use ¾-inch x 1-¼-inch wood to make these pieces for the front frame of the cover. Add 2 inches to the width of the radiator and cut two pieces of wood to this number. These should also be from ¾-inch x 1-1/14-inch wood and will be used for the front frame. Make the front frame by placing the two vertical pieces on a surface so they are vertical and parallel to each other. Lay the horizontal pieces between the two vertical pieces. Move the upper horizontal piece so its top is flush with the tops of the vertical pieces. The lower piece should be placed 2 inches up from the bottom of the vertical pieces. Glue the frame pieces together and screw them in at each corner to make them secure. Use a power drill and stainless-steel screws. Cut out two pieces of 1-inch-thick wood to the same height as the front frame. The width of these pieces should be the depth of the radiator plus 2 inches. These are the sides of the cover. Make a rectangular cut into the bottom of both side pieces. The cuts should be 2 inches tall and long enough so that you are left with only 1-¼ inches of wood at one end. This will leave you with a small foot measuring 1-¼ inches wide on the back of each side piece. Glue the side pieces to the front frame, so that if you look at it from above, you will see a "U" shape. Apply glue along the long edge of each side where you made the cut. The sides should line up perpendicularly with the vertical sides of the front frame. Drill through the front frame and into the side pieces to attach them more securely. Use three evenly spaced screws along the vertical sides of the front frame. Attach the screen on the inside of the cover over the opening in the front frame. Use a staple gun to attach the screen securely to the wood. Trim away the excess screen so it is tidy-looking. Install four L-brackets to the upper inside edges of the cover with screws and a screwdriver. The vertical side of the "L" should be against the cover walls, with the horizontal side flush with the top edge and pointing inward. Cut a piece of 1-inch-thick wood for a lid. When the lid is set on top of the cover, it should hang over the edge of the cover on each side by ¾ inch. Attach the lid to the cover by inserting short screws through the L-brackets and into the lid. Fill all of the screw-head marks with wood filler and prime the entire cover. Finally, paint the cover with whatever color you want.